Well, our Earth Day Challenge is over, and we ended up with over 18,000 signatures, well over double the projected Estima Hybrid sales in Japan this year, as I mentioned in an earlier post. We’re prepping the petition for delivery to Toyota, and will be announcing the winners of our Earth Day Challenge contest next week. Thanks to all who made this effort a resounding success. In the meantime, here’s a tidbit that raises hopes of our efforts tipping the tide. Note the quote in this Edmunds article from Toyota Sales, U.S.A. General Manager Bob Carter, who says, "Personally I think [a Sienna hybrid] would be a home run...But that decision has not been made." We’re with you, Bob, and we want that decision made soon…with the focus on fuel efficiency. 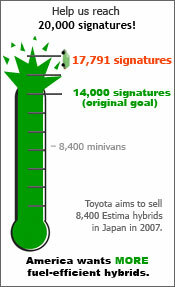 One month ago, we launched our Earth Day Challenge ’07—a petition urging Toyota to focus on fuel-efficient use of hybrid technology in the U.S. market, such as a hybrid minivan like the Estima Hybrid they sell in Japan. We hoped members of our Driving Change Network like you would help us get more than 8,400 signatures, surpassing the number of projected Estima Hybrid sales in Japan this year. And guess what? We’ve already blown that number away! We now have more than 17,000 signatures. That’s DOUBLE the projected Estima Hybrid sales—no doubt a tremendous consumer chorus for cleaner cars. But with our May 28 deadline still 10 days away, we have a chance to make our appeal even stronger! Can you help us get past the 20,000 mark? I wanted to personally thank you for helping to make this happen with your signature. Now help spread the word! Click here and tell your friends about how they can help the planet, and help you qualify for our contest to as well! Thank you once again for helping to make our Earth Day Challenge a huge success for the second year in a row. Remember, the deadline is May 28, so spread the word today. As you can see, we’re closing in on 18,000 signatures, now. Thanks to everyone who has already made our effort a success, and please keep spreading the word! Remember, the HybridCenter Earth Day Challenge runs through May 28 -- Take Action Today! The last seven days have been big for the fuel economy debate on Capitol Hill. As you know the Fuel Economy Reform Act, H.R. 1506, hit the House about a month back, and its cosponsor list has climbed to 124 to date. The real action has been in the Senate, however, where the Ten-In-Ten Fuel Economy Act, S. 357, went up for consideration in front of the Senate Commerce Committee. As introduced, this practical bill would increase the average fuel economy of our cars, pickups, minivans, and SUVs approximately 10 miles per gallon over 10 years (to 35 miles per gallon by 2019). Last week, the committee held an informational hearing on the bill before considering it directly. Our very own research director David Friedman was asked to testify, and as you can see from his testimony, he tried to move the debate past the usual lines by focusing on what can be done, and what’s at stake if we do not act. Unfortunately, it seems a bit difficult for some to shed the past. For example, Senator Tom Carper (D-DE) and Auto Alliance head Dave McCurdy both carted out the old claim that automakers can only make hybrids at a financial loss to show how fiscally unfeasible increased fuel economy is. This is wrong in not one, but two different ways. First, it’s factually incorrect. Toyota has said on countless occasions that they have made a profit on every hybrid since the ’04 Prius. Indeed, they now see hybrids as a key part of their future profit plans. Facts aside, this is just a red herring, as automakers don’t need to invest in hybrids in order to make significant strides on fuel economy. We noted this some time ago when GM introduced the Green Line Vue. While it’s not a hybrid, it is a solid improvement in conventional technologies that, if applied throughout the Vue fleet, would make more of an oil savings and emissions impact than the current fleet of Escape/Mariner hybrids. So there’s more than one way to make improvements in fuel economy work, and every automaker has the technologies to do so sitting on their shelves. The well-attended hearing provided a great opportunity to revisit the decades-old auto industry rhetoric against strengthening Corporate Average Fuel Economy (CAFE) standards. It also gave us a glimpse of the Alliance of Automobile Manufacturers not-so-new direction. As expected, the auto industry panelists said they prefered economy-wide policies and touted their own investment in advanced technologies, and as always bashed increased CAFE standards as financially ruinous. Yet, as noted by national security expert vice admiral Dennis McGinn (Ret.) and UCS research director David Friedman, strengthening CAFE standards is a critical and necessary first step to motivate a reluctant auto industry to invest in advanced technologies. Economy-wide climate policies and introduction of small numbers of advanced technology vehicles will not guarantee the energy security benefits and global warming pollution reductions from the automotive fleet. Indeed, the auto industry remains reluctant to change. Even Alliance of Automobile Manufacturers president Dave McCurdy, who many hoped would usher in a new era of leadership at the organization, reiterated the standard auto industry arguments and “can’t do” attitude. Hopefully, Mr. McCurdy will read some of the nearly 13,500 letters our activists sent him urging reconciliation and cooperation between the auto industry and environmental/science communities on important vehicle issues. And so with all this, the committee worked through S. 357 on Tuesday the 8th. What came out was, to be honest, not the most desirable result. While the basic target of 35 mpg did remain, a number of loopholes were inserted that ended up making this weaker than the initial bill, and the targets are weaker than the Bush Administration goal of reducing gasoline use by 8.5 billion gallons in 2017. If the automakers drag their feet and succeed in delaying the implementation of the targets, the bill as passed could turn it into a status quo proposal. Now that this proposal to increase CAFE standards will go to the floor, it will be an essential part of the energy debate. I will fight to improve the bill on the floor and to guarantee improvements of at least 31 mpg by 2015 and 35mpg by 2020. While fuel efficiency technologies have greatly improved over the years, the fuel economy of the nation’s passenger fleet has not. Since America’s second oil crisis in 1980, our oil imports have increased from 37 to 56 percent, but our passenger fleet averages 25 mpg, the same average in 1981. We’re with Senator Kerry and others in the Senate who will be working to ensure a strong fuel economy bill advances, and so are the American people. Heck, as this piece by pollster Mark Mellman points out, rural truck drivers—the supposed backbone of anti-fuel economy sentiment in America—get it. Hopefully as the summer driving season hits, finally Congress will get it too. We’re off to a strong start in our month-long campaign to send a message to Toyota about the nature of the hybrid market. I’m happy to announce that we’re already over 13,000 signatures toward our goal of 14,000 petitions asking Toyota to bring a fuel-efficient minivan option to America. If you’ve yet to sign the petition or help spread the word, please get involved and get a chance at our “Cool Car – Cool Planet” prizes! Q: I'm glad you're prodding Toyota to produce a fuel-efficient hybrid minivan, but why not also prod Honda? They're the other major producer of hybrid vehicles, with at least as much experience and as broad a range as Toyota, plus their Odyssey minivan has been top rated in the U.S. for quite a few years. A: You're right about Honda, but Ford, GM, and DaimlerChrysler also have minivans and hybrid technology that could do the job. We are singling out Toyota because they have a hybrid minivan on the roads (two actually, as you’ll see below). That said, we hope that a petition of this sort will have ramifications beyond Toyota itself, and demonstrate to all the automakers that a hybrid minivan would be a smart business move, and, as importantly, that the public is concerned about the growing trend of using hybrid technology to boost power rather than efficiency. Q: Many of us were anxious for Toyota to import the Estima to the U.S. The conclusion from Toyota seemed to be that since it is a smaller version of the standard US minivans, it would not sell in this market. We all thought them VERY wrong. My wife & I spent last month in Australia and saw many of the gas versions of the Estima. My understanding is that Toyota plans to introduce a hybrid version of the Sienna van, perhaps in 2009. A: Consumers keep getting teased with vague promises about the Sienna Hybrid. We felt a concerted campaign might help get Toyota “over the top” on this important decision. A: It’s because I can’t support any vehicle with a name as silly sounding as “Alphard.” Okay, not really. The Alphard is more of the luxury-end Toyota minivan in Japan. The hybrid has four wheel drive, and would get roughly high-20s or low-30s for Environmental Protection Agency-estimated gas mileage (it gets about 42 mpg on the Japanese test cycle as opposed to 47 for the Estima). There are a couple of reasons why the Estima works better as the example vehicle for our campaign. First, at its essence, this petition is a statement to Toyota and the other automakers that Americans want fuel efficiency to come first when it comes to the expansion of hybrid choices. If Toyota acts on our petition, I would expect that the option we will likely see in the United States would be a Sienna Hybrid (likely built in Indiana). The key is to make sure that as they adapt the Hybrid Synergy Drive for the Sienna, they are thinking about how many miles per gallon they can squeeze out of it, not about making a more powerful Sienna that gets slightly better fuel economy. Second, given that in America, Toyota is now putting out more high-end and muscle hybrid choices than fuel-efficiency hybrids (3 Lexus models and the Highlander Hybrid vs. Prius and Camry Hybrid), choosing the less “tricked out” version of a hybrid minivan makes a secondary statement—hybrid options should be made available to all consumers, and not just be seen as a luxury item. Toyota did a very good job of that with the Camry Hybrid, making its premium over the standard Camry quite reasonable. As the technology spreads and the per-unit cost drops, the goal should be to get fuel-efficient technology into as many hands as possible. If you have any questions or comments about our campaign, please feel free to send them to me at hybridcenter@ucsusa.org. And don’t forget to take action and spread the word!